During the eight-week online course, TGC participants were asked to create a "Digital Learning Inventory" of their schools. We were to answer several questions pertaining to our use technology to promote global learning. Below is a comprehensive list of relevant tools and software we use at Stow-Munroe Falls High School. Take a look yourself in determining your own technological needs of both yourself and your students when in comes to connecting your students to the world via technology. Glogster - Glogster is an interactive poster where students can insert text, graphics, videos, and music all in one page either portrait or landscape. Glogster also offers teacher accounts where you can have access to your students' work, but this comes with a fee. I use Glogster in my classes as an introductory "All of me" assignment as well as for more detailed research such as a Glogster on trade statistics and research on a specific country. 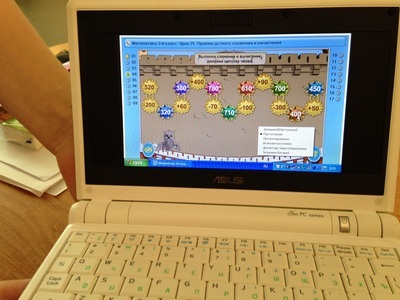 Go Animate - Go Animate is a cartoon, animation site where students can create interactive dialogue between characters. Go Animate offers a free shortened version, or you can upgrade to a teacher account and pay a minimum fee for the year. I have partnered with another teacher to split the fee. It is well worth it. I have my students research non profit organizations, both in the US and abroad, and create an interesting scenario between characters talking about the organization and presenting the information they researched. It offers a different way of presenting valuable information to the class and can be humorous and entertaining. Prezi - Prezi is a great way to go beyond the slides of a PowerPoint, but still create a professional, organized presentation. Prezi offers an interactive, infinite space that allows a presenter to zoom into information - making the presentation more engaging and memorable for the audience. I also like that Prezi can embed videos. I have my students use Prezi for a variety of presentations and they become better each time they use it. There is definitely a learning curve when it comes to Prezi, but there are many tutorials on the Prezi website as well as on youtube. Animoto - Animoto is a quick, easy way to prepare entertaining videos using photos and text in order to convey information. Animoto offers a free 30-second video to choose from or you can subscribe to various levels, with varying levels of prices and features. I bought the minimum package for my students and have used it for many of my classes. I have used animoto to make videos about career research, videos on culture, videos on internet safety. Combining photos and text, students can communicate their thoughts in an awesome, professional format with combining music and graphics. Tagxedo/Wordle - I absolutely love these word cloud websites. Tagxedo and Wordle are very similar, with the biggest difference being that tagxedo can form your word cloud into a specific shape, where wordle only makes a random cloud shape. Both sites are for generating “word clouds” from a chunk of text that you provide. The clouds give greater prominence to words that appear more frequently in the source text. You can tweak your clouds with different fonts, layouts, and color schemes. These clouds can be printed or saved to share with others. I have my students create word clouds on certain chapters or units we study. I also have them create one as a screen saver, utilizing text from the CIA factbook on their country of choosing for my International Business class. It is an amazing tool to see what words are most prevalent when it comes to researching a specific topic. The ideas are endless for using these word clouds, but their image is very powerful. 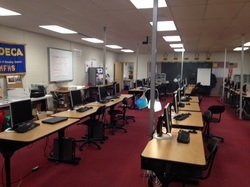 My classroom at Stow High School. Each student is equipped with their own desktop computer. 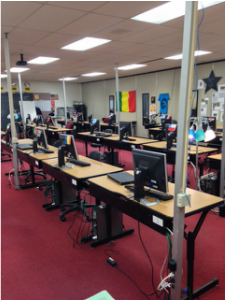 25 workstations in the class.